Heirloom vegetables are fun to grow because they’re odd and sometimes look other worldly. They don’t have the standard, grocery store look. Agri businesses that supply our “super” grocery stores grow vegetables for looks, ease of transportation and shelf life. We can buy picture perfect vegetables in abundance at any food store. So, why grow odd, sometimes ugly heirloom vegetables? In a word, nutrients. A study published in the Journal of the American College of Nutrition compared the nutritional values of 43 garden crops from 1950 and 1999. They found a decline in six nutrients across the crop group. Yet another reason to “grow your own”. Washington based heirloom seed distributors include Ed Hume Seeds, Not Spuds and Uprising Seeds. Another large selection of heirloom vegetable seeds is at www.heirloomseeds.com..
Every garden is made interesting by adding rare and unusual plants. However, that same garden is held together with some “powerhouse” plants that are easy and long lasting. If evergreens are the “bones” of the garden, “powerhouse” plants are the “backbones” of the garden. Take daylilies for instance. 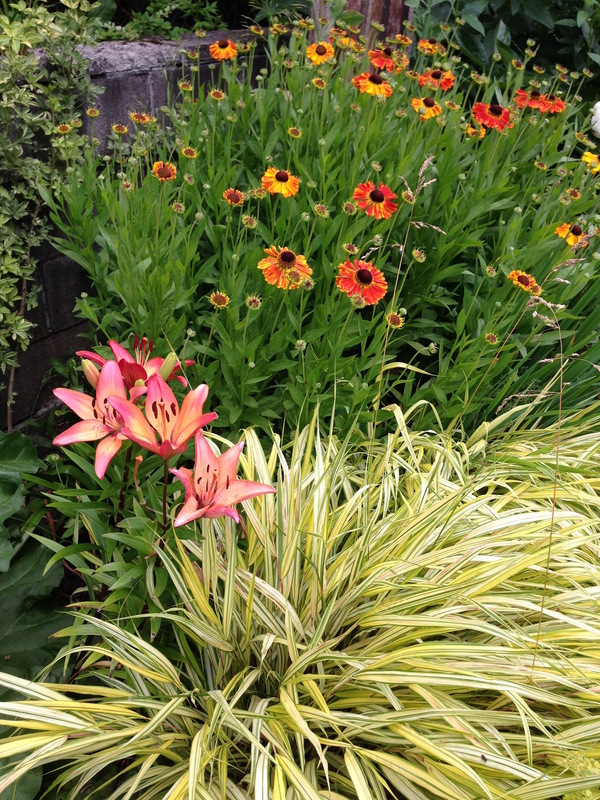 Daylilies are tough, long lasting and depending on the variety, provide blooms from June to September. Daffodils are “powerhouse” plants but tulips aren’t. Daffs multiply, come back year after year and neither deer nor squirrels find them tasty. Ferns and hostas for shade gardens are practically impossible to kill so use them often. There is a really good reason why some of the most common plants are still around. They’re “powerhouse” plants that survive no matter what. Plant those and then go for the wild and crazy new varieties to distribute among the reliables. Even “gym rats” find new muscles when they turn to gardening. “Gardener’s Yoga” is a little gem of a book that scales back yoga movements just for gardeners. Gardening requires more bending and stretching that brute force. The 21 gentle yoga positions in “Gardener’s Yoga” by Seattle author Veronica d’orazio, get you ready and help maintain some flexibility for playing in the dirt. The positions are basic and easy. You won’t be standing on your head or balancing on an elbow. Sasquatch Books, $12.95, 64 pages.